An asbestos manufacturer’s challenge to a state trial court’s decision finding its asbestos containing products to be the cause of a decedent’s illness and subsequent death, along with its challenge to the damages awarded to the decedent’s adult children, was rejected by a majority of the Louisiana Court of Appeal, Third Circuit. In reaching this conclusion, the appellate panel concluded that the decedent’s exposure to asbestos related to her husband’s work with compressors manufactured by the defendant was significant and was a substantial factor in her contracting mesothelioma (Williams v. Placid Oil Co., August 2, 2017, Cooks, S.). The wife of an oil facility worker who was regularly exposed to asbestos fibers and dust on her husband’s clothing and in their family car contracted malignant mesothelioma and died as a result of bystander asbestos exposure. Following her death, her husband and four children filed suit against the husband’s employer and a number of entities involved in the manufacture of asbestos products used by the oil facility during the husband’s employment. The claim included a survival action on behalf of the decedent and wrongful death actions on behalf of the decedent’s husband and children. Over the course of the proceeding, several entities were dismissed and the family settled with others. The trial eventually proceeded against one manufacturer, Ingersoll-Rand, as the sole remaining defendant. After a three-day bench trial, the court found against the manufacturer. As to the survival action, the court found the manufacturer and the husband’s employer, in its capacity as the premises owner, equally at fault for causing the decedent’s mesothelioma. As for the wrongful death action, the manufacturer was found solely at fault for the decedent’s illness. The survival claim netted damages of $3,000,000, while the wrongful death actions resulted in damages of $1,000,000 for the decedent’s husband and $750,000 for each of the decedent’s four children. The manufacturer appealed the judgment. Causation. Initially, the manufacturer argued that the court erred in finding that the plaintiffs had proven a causal connection between the decedent’s disease and the manufacturer’s product. The uncontradicted evidence showed that the manufacturer’s compressors, which used asbestos insulation, were present at the husband’s place of employment and that in the normal course of his work the husband was exposed to asbestos fibers and dust from the compressors. The manufacturer’s claim that aluminum sleeves prevented the escape of asbestos fiber and dust was unavailing based on witness testimony that not all of the compressors had the sleeve and that asbestos fibers and dust were constantly present and visible in the compressor room. Alternatively, the manufacturer attempted to defeat causation by asserting that the plaintiffs failed to establish the exact "dose" of exposure to asbestos the decedent had experienced. The court rejected this argument, reasoning that such proof is not required. The plaintiff merely had to establish that the exposure was significant and was a substantial factor in bringing on the disease. Consequently, the appellate panel found no error in the trial court’s causation finding. Survival action. The manufacturer next challenged the trial court’s assignment of an equal share of responsibility to it and the premises owner in the survival action. The manufacturer contended that the premises owner could have been assigned a greater percentage of fault. 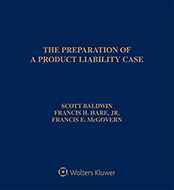 The court disagreed, finding that for the survival action pre-comparative fault law controlled the question of liability due to the fact that the exposure occurred prior to 1980. Under the pre-comparative fault law, each liable defendant has an equal, virile share of the award provided to the plaintiffs. Furthermore, the manufacturer failed to present evidence establishing fault on the part of any other parties in order to offset its percentage of responsibility. Thus, the trial court’s decision on the survival action was affirmed. Wrongful death. On the wrongful death issue, the manufacturer argued that the trial court erred in finding it 100 percent liable, asserting that at the very least the percentage of liability for the wrongful death action should be the same as the survival action. The appellate panel disagreed, noting that the survival action and the wrongful death actions were separate and distinct causes of action that arose at different times and allowed recovery of different damages. In this case, because the wrongful death claim accrued under the comparative fault system, in order to establish liability on the part of the premises owner there must be a showing that the owner knew or should have known of the dangers. The absence of evidence of knowledge on the part of the premises owner resulted in a valid finding of no liability for the premises owner for the wrongful death claims. Damage awards. Finally, the manufacturer challenged the amount of the wrongful death awards to the decedent’s children. After reviewing the lower court’s reasoning and the testimony presented by the family related to the toll the decedent’s death had on them, the appellate panel stated that while the awards to the children were high, the trial court had not abused its discretion in awarding each child $750,000. Dissenting opinions. In separate concurring/dissenting opinions, two justices voiced their concerns regarding the assignment of fault on the wrongful death claims, with both opining that the fault for both the survival and wrongful death actions should have been shared between the manufacturer and the employer/premises owner. Moreover, one of the dissenting opinions also reasoned that the wrongful death awards to the decedent’s children were excessive and should be reduced to $500,000 each. The case is No. 16-839. Attorneys: Wells T. Watson (Baggett, McCall, Burgess, Watson & Gaughan, LLC) for Jimmy Williams, Sr. Joseph B. Morton (Maron Marvel Bradley Anderson & Tardy LLC) for Ingersoll-Rand Co.
Companies: Placid Oil Co.; Ingersoll-Rand Co.